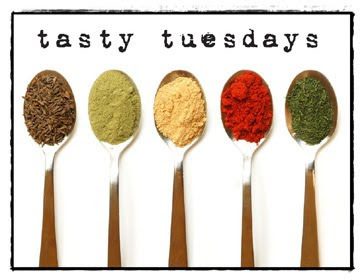 Welcome to Tasty Tuesdays. A place to share favorite family recipes. I'd love for you to play along. Grab the button to the right and link up. We could use a little diversity over here. This is one I previously posted on St. Patrick's Day for those of you who follow me. Some recipes are just worth repeating. This is one of those. Thanks Shawn for being so domesticated and passing on some great ones to your big sis. 1. I do not profess to be a gourmet chef of any kind. Nor do I want to be. Period. 2. I try to spend as little time in the kitchen as possible. Unless Family Feud is on. 3. All recipes I post are tried and true. 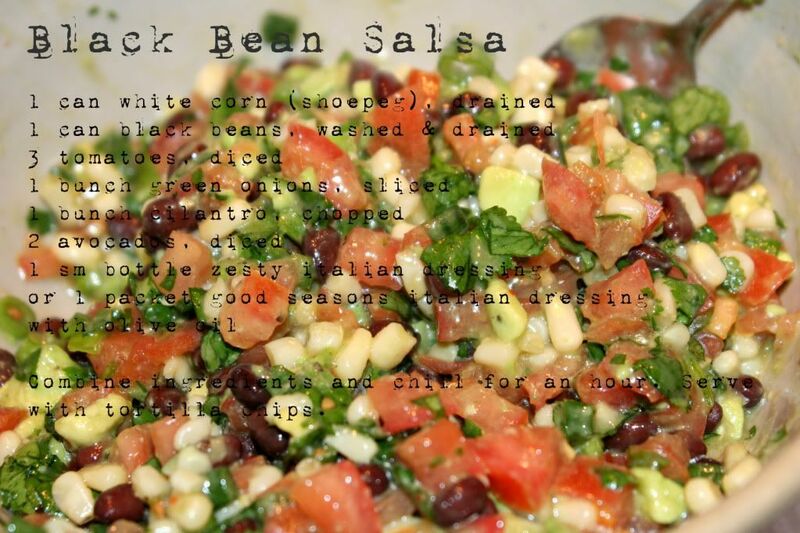 Below is our Black Bean Salsa. Way yummier than it looks. Grab some scoops and you have yourself a fantastic treat. There are NO RULES for you. Link up with any recipe, old or new. Anything goes. Anything that strikes your fancy. Tell us what you're cookin up. Link up below. YUM! Fresh salsa made with black beans? Two of my favorite things!! This looks really good, I love black bean salsa. Thanks for the recipe! I love black bean salsa! Yum. Yours looks delicious! That salsa looks so delicious - and healthy too with the beans, fresh tomatoes etc :) Thank you for hosting. I am on the same mission as you - easy, yummy & kid friendly! I love your images. Such big clear beautiful photos. And the food looks divine!!! Hey Lish... I've linked up a recipe for Pikelets... don't know if you have those in your neck of the woods, but they are like mini pancakes, great for snacks and parties, nice and easy. Course i will have to be making these GLUTEN FREE from now on... maybe next week i will have some gluten free recipes tried and tested to link up?? looks good, we love salsas! not joining in again this week...got notice of one of my recipes being a guest post at Smarty Pants Mama today! Okay, that looks delicious! You went and made me homesick for TX. Looks great and pretty healthy too! Thanks for sharing! I am so going to try this tonite! It looks yummy! Your salsa looks delish! My boys would love it! Thanks so much for hosting another great TT! Love this! Thanks for the recipe! I am gonna link back up soon. Got some new recipes up my sleeve. I don't like beans, but Craig ADORES them! He'd go crazy for this. We are big chips and salsa eaters around here so this is going to be a must try recipe! Thanks! Oh gosh I love black beans. And I love avocados! I am looking forward to trying this! Thanks for hosting. I missed this the first time around so I'm glad I didn't today. This is my FAVORITE kind of salsa. I have a similar recipe called cowboy salsa or something like that. Yours looks phenomenally delicious. No joke I had that last week and it's AMAZING!!! I've been looking for a good Black Bean Salsa Recipe. I tasted someone's a year ago and dying to find one like it again. This looks like it would be a good match. Thanks! Pretty sure I need to make this soon and very soon! We just had fish tacos...this would've been perfect! Next time definitely! Wow - does that black bean salsa ever look good! Love that you have it formatted to print out on a recipe card. I'm making it very soon! I love a good homemade salsa and this ones looks so tasty! I'm gonna have to make this - it looks amazing! I'm a pretty new mostly vegetarian, and anything with black beans in it moves to the top of the "gotta try it!" list! Thanks! I've got a black bean salsa recipe that I make a lot - but this one looks great - I love that it has avocado in it and a little dressing. Mmmm. Yeah, the lemonade was really just me trying hard to make the dressing work when out of other options. You can turn really resourceful when you are in a bind! I LOOOVE salsa and that looks so good. Thanks for sharing! Yum! One of my favorite recipes! !